Are the calories half empty or half full? It's easy being with green. 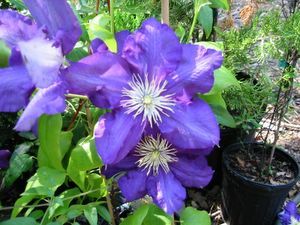 Here is a gorgeous clematis that will go in the ground soon. 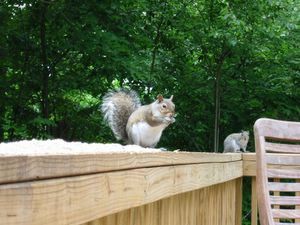 These guys have been chewing on my deck rail! Yesterday, one was even chewing while there were seeds there. The ones pictured here are tame enough such that they aren't bothered by my being just a few feet away. They know who puts out the birdseed for them. This is really starting to look neat. 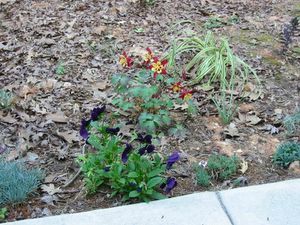 The salvias add a lot of color. 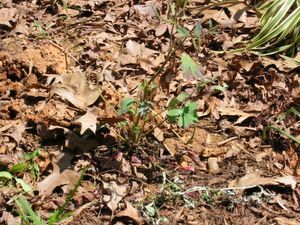 After deer. My poor columbine... The deer have been doing a lot of damage lately. The worst that I've noticed has been to my magnolia and my witchhazel, which only has a small numbers of leaves left. Yesterday my mom planted a whole bunch of plants in my garden. It's looking quite lovely. Last night, my parents and I went to ACME for dinner. I got soft shell crabs with some bacon, tomato and arugula topping. It came with jasmine rice, but I asked for French fries instead, because I really felt like eating some of their wonderful fries. My mom decided at the last minute to get a side order of fries, too. Well, I'd say we ended up with maybe ten cups of fries. I just filed a 6 cup container with my leftovers, so that might still be an underestimate. Due to the huge amount of food, I was not able to order the warm lemon pudding cake for dessert. 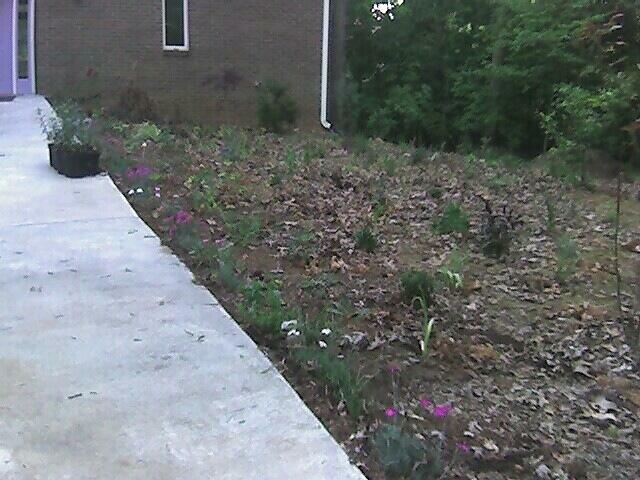 This afternoon, my mom planted even more plants in my garden and started working on adding the mulch. I worked on deadheading the dianthus blossums with cool new grass cutting shears. My dad and I headed over to the Barbecue Joint for dinner. I ordered brunswick stew, but what I got had sausage in it, which seemed surprising. It didn't have okra in it, so it probably wasn't the gumbo. Regardless of what it was, it was quite good. It came with a side of cornbread and I still think they have the best cornbread in the Triangle. I also ate quite a few of my dad's pickled cucumbers, of which I am very fond. For dessert we shared cheddar crusted apple pie and strawberry rhubarb peach cobbler. The cool thing about the cobbler is that you could really taste each invidual flavor. At some point this weekend, we were all discussing the concept of "empty calories". It is my philosophy that one should avoid eating them. My mom pointed out that my brownies could be considered empty calories. I disagreed, because the chocolate contains antioxidants. Upon contemplating this further throughout the weekend, I have concluded that my idea of empty calories is pretty much limited to soft drinks and mediocre French fries. Good French fries increase morale, you know. That's right, as of today, I have lived in my house exactly one year. It doesn't feel as if it's been that long at all. I've learned a lot of things in the past year, but primarily an appreciation for the amount of work it takes to keep a house looking somewhat tidy. Today I went to the Durham FM Association hamfest, also known as DurHAMfest. I worked at the club table, with SE, which was fun. We sold quite a bit of stuff. Given that I'd never worked at the club table before, I had nothing to compare it to, it's possible it wasn't a lot, but it seemed like it to me. The exciting thing was that I baked two batches of brownies last night to sell at the fest. All the proceeds went to the club. I had 45 brownies at a dollar each and 36 of them sold! I thought that was pretty cool. This was the first time I'd been to the new location for the fest, at the National Guard Armory, in northern Durham. It didn't seem too bad, although there wasn't much accidental traffic. When we had it at the South Square mall parking deck, some of the people buying tickets were mall-goers. Now, if you're there, you pretty much planned to be there and are a ham. My memories of Monday and Tuesday seem to have winked out of existence. Fortunately, the rest of the week has been salvaged. Wednesday night.. wait.. Tuesday is coming back. Tuesday night, my parents came over and watched Sweet Home Alabama with me. We'd seen part of it on television and wanted to actually rent the whole thing. It was fairly entertaining. Wednesday night, I made two batches of brownies for a meeting the following day. It is supposed to be a brief bi-weekly meetingfor all of my boss's boss's organization, but not all of the people show up for it. This is really surprising, considering that there is free food involved. These people have been out of college for too long, I guess. The drizzling of the semi-sweet chocolate worked much better than it did when I tried using melted chocolate chips. It worked especially well for the batch with nuts, since I looked on the inside of the box at the microwave melting instructions and saw that I was supposed to stir it every thirty seconds. I was too lazy to look at the instructions for the batch without nuts. While my drizzles were not the beautiful diagnoal lines featured on the box of Baker's chocolate, they did resemble, according to GM, crop circles and embryos. I call that success. RD came over Thursday night. I finally got to show him my house and it was great having a very lengthy conversation with him after many years. I used to spend a lot of time talking to him in his office when I was in college. He actually has more candy in his office than I do in mine. On Friday, I suggested to GM and AE that we might want to order our Star Wars: Revenge of the Sith tickets in advance. Instead of ordering them immediately I waited for their reply and I actually didn't get back to my personal mail for a couple of hours. At that point, I looked at movietickets.com and saw that they had sold out of the 3:45 showing, which is the time we had planned to go. I wrote to GM and AE and pointed out the tragedy. They had already purchased their tickets. I was distraught. AE even offered me her ticket. I later looked at the website again, to see how many other showings had sold out since then. Then, it finally dawned on me. I had been looking at the wrong day. If you've been reading my blog for a while, or even if you haven't, you have probably gathered than I am a flake. Well, you are very perceptive. On Friday night, my parents and I went to Taverna Nikos for dinner and as we were driving home, my mom called my dad and me on the ham radio saying that the light at Lawrence and 70 was out. Well, it turns out at the power was out in the whole area. It was wild coming home to a completely dark house. I guess this was the first lengthy power failure since I moved, almost a year ago. We still don't know what caused it. Unfortunately, my cool neato five LED flashlight from ThinkGeek is missing. I haven't the faintest idea where I misplaced it. Fortunately, I did know where my candles from GA were and the matches were in a box right next to them. Plus, my solar turtle, from CL, worked beautifully. There's nothing like useful house warming gifts. The good thing is that I did get to go see the latest Star Wars today and I enjoyed it. The acting was only slightly better than the previous one, but all and all it was good. This one did not come across as a kids movie, by any means. Despite the fact that it had a lot of fighting and violence, it was not bloody. Most of the death was implied. Afterwards, AE, GM and I went back to my house. We ordered pizzas from Papa John's and watched the first episode of the BBC miniseries of the Hitchhiker's Guide to the Galaxy. I hadn't seen it since it was first shown in the US, so it's pretty wild seeing what I did and didn't remember. I had remembered the Vogons as looking completely different, for example. I'd remembered some of the actors as ones I'd seen in other British comedies. It was, however, quite good. I'm looking forward to seeing the other five episodes. This morning, once I finished playing with my Treo 650 from bed, I got up and went to the Duke Computer Science graduation ceremonies. Fewer and fewer people are majoring in computer science. This means two things. There are few students that get up to shake hands with my dad and a few other faculty. There is more time for relatives to jump up and take photos of each student. In fact, they even had one of the university photographers there to take a shot of each graduate and faculty. Of course, he's a ham radio operator, so that's very cool. The food served following the ceremony was excellent this year. For the past several years, it's been done by Fares's catering company, so it's usually quite good. He runs the cafeteria closest to the computer science department, where I used to eat lunch every day. I ate very well my last couple of years at Duke. This year, instead of sandwiches, they had mostly salads. They had a taragon chicken salad that was just wonderful as well as a rice and garbonzo bean salad. The chicken salad had just a few grapes and strawberries in it. The strawberries and chicken were a neat combination. While my parents and I ate, we talked to other faculty, including RD, whom I hadn't gotten to talk to in an age and a half. My Treo 650 exhibited some strange behavior today. The blinky green light turned solid orange. It's likely that this was because of Verichat. From what I could tell from googling, it's because I received a message while I was in another application on my phone. The only way to get rid of the orange is through a soft reset. Fortunately, I upgraded to a newer version of Verichat and that included a soft reset as part of the install. It never hurts to be efficient. I don't know if this orange bug is included in the new version I installed, but as bugs go, it isn't so bad. I still think it's the coolest thing I've seen lately. This evening, I met JJ and JA for dinner at Vinny's. I think they liked it, which was great. I had yet another serving of eggplant parmesan. JJ raised the question of who Churton was, since the restaurant is in the Churton Grove Center shopping center and the main street in Hillsborough is Churton Street. Well, William Churton was the surveyor who laid out Hillsborough in1754, but here is more than you have ever wanted to know about him. Afterwards we went to the Coffee Cafe and I finally tried out their coffee, a decaf cafe mocha with skim, my usual. I also couldn't resist getting a chocolate Bavarian strudel to take home. We also shared a lemon cookie, which was quite good and delicately tart. Finally, we tried Altoids gum, since none of us had before. It was just as strong at the beginning, but quickly became mild, unlike the original tablets if you don't chew them up. Nice. Now I can blog from bed without my laptop. It&#39;s sloth at its best although my thumbs get lots of exercise. I love my Treo 650! Here you can see some of the progress that my mom has been making in my garden. 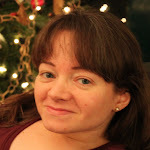 Blogger Mobile worked with this smaller image. I've been having problems with Blogger's new Blogger Mobile feature. Last weekend, I tried it out and I swear one of my pictures showed up, but the next morning it was gone. I searched technorati and at least one other person had similar problems. Ever since then, it's rejected my two posts with an error that the size was exceeded. According to the FAQ, the size limit is 250k. According to my phone, the image and text I've been sending were a total of 164k. I'm not entirely sure what's going on. I haven't tried their original Mail-to-Blogger feature, but I guess that's worth a try. I got some very good software for my Treo 650 this week. I got some mail from Handmark that included info about a instant messaging client called VeriChat. I decided to look for a free trial and I have been immensely pleased. It is infinitely better than using AIM through the Blazer browser. In addition to AIM, it includes MSN, Yahoo and ICQ. I am extremely pleased with this find. On Tuesday, I went to the Durham FM Association meeting. There wasn't an official speaker this time, because it was time to discuss preparations for the upcoming hamfest, which will be on May 28th at the National Guard Armory, in Durham. It looks as if I will be working at the club table, with SE. Members of the club put items there that that they want to sell and the club takes a percentage. Yesterday, at work, we had our spring mandatory fun. After a meeting, we had a picnic at the recreation center. The weather was perfect. The food was done by the cafeteria, but the fried chicken was quite good. This morning I went to the Orange County Radio Amateurs breakfast. Nothing out of the ordinary happened, but we did have a decent crowd. This weekend is graduation weekend for the universities in the area, which means that you can't drive anywhere without being behind parents who are lost. It's impossible to get dinner reservations and, of course, lots of graduation festivites are going on. This afternoon, I went to the reception on Duke's East Campus lawn. I, of course, go for the food. The fruit was particularly good this year, particularly the pineapple and the strawberries. Otherwise, nothing was terribly exciting. Not too much happened during the past week other than work. Fortunately, this weekend has already been making up for it. Last night, I met GM, AE and JH at Southpoint. We went to Rockfish for dinner and they had coconut shrimp as their appetizer. Naturally, I had two orders as my meal. In hindsight, perhaps one order and a salad, the way I did it at Outback, would have been a better choice. It was good, though. We also had calamari as our appetizer and we shared stories about our encounters with bats. I didn't have much to add to the conversation other than sheer amazement. They ranged from having bats flopping about in the room to actual blood dripping from a bite. After this conversation, I was actually quite glad that I wasn't able to contribute. I think bats are cute. After that JH and I went across the way to Marble Slab Creamery and AE and GM went toward the theatre, to head to the chocolate shop. After a terrible bout of decision making, I decided to have vanilla cinnamon with coconut and slivered almonds. I think I've had something similar before, as my faithful blog readers will, of course, remember. We met up again and starting heading toward the theatre. While we were standing around eating ice cream, a guy came up and said to me that he thought I'd be drinking beer instead of ice cream by now and then he walked off. I was almost positive that I didn't know him, but many people confuse me with other people. Then we noticed that there were a bunch of people wandering around strangely near the fountain across from the movie theatre. It gave the impression that they were doing some sort of free theatrical performance. It was kind of a warped Wizard of Oz type thing. Each of them was going around saying that they were witches, tornados, wizards or chihuahuahs. There was a cowardly lion that had a sign on his chest saying that he was only 80% cowardly. It was all quite odd. JH gave them his free ice cream card when it was over. Although they refused monetary donations from other people, they did accept the card. The guy that had approached us earlier joined the "audience" at some point. The people in the group asked people in the audience to share their vision for the world. The guy, who later said his name was Bruce, launched into a description of a quasi-pantheistic world view. Given that the performers didn't really address his religious views, it seems unlikely that they were from a religious group. They said something about being in a leadership group and it was something they had to do. After the performers ran off to the parking lot, Bruce told us that he hadn't been getting along with his girlfriend and her mother and that they were still inside. JH gave him some vague consoling responses and he eventually went back inside. The movie, Hitchhiker's Guide to the Galaxy, was quite good. I thought it was cool how they combined modern day special effects with almost retro ones, particularly for the spaceship. Unfortunately, it's been quite a few years since I read the trilogy, so I still don't have a particularly good idea of how faithful it was to the book. GM and AE thought it was good, though. Even though JH hadn't read the book at all, he still seemed to enjoy it. My traffic cone was stolen in the parking lot. Fortunately, I have more. I'm surprised that I've been using them this long without getting one stolen before. This morning, there was amusing squirrel behavior. This squirel flung the side of his body against the deck doors a few times. Then, when I approached the door, he got on one of the patio chairs and stared at me. I got some birdseed out of the garage and he stayed on the deck rail while I put it out. Quite a demanding fellow. I think that's pretty cool, though. The weather was beautiful today and my mom came over to plant and do some weeding. 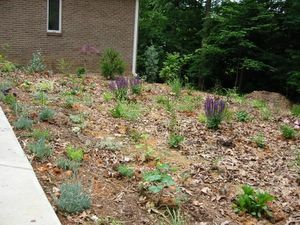 The flower bed in front of the house is really coming along. This afternoon, I made my first ITunes purchase. I was looking for Hitchhiker's old theme song, "Journey of the Sorcerer". They included part of it in the movie and I could get it from the soundtrack. That was just 1 minute and 15 seconds long. It turned out that I could get the original version, which was performed by the Eagles. The awesome thing was that the original, which is what I really wanted anyway, was over 6 minutes long. Considering that both were 99 cents, regardless, I was pretty happy to get more song for my money. The bad thing is that somehow I hadn't realized that ITunes music was in AAC or mpeg4 format. I'd wanted to be able to play it on my Treo 650 phone. For now, all I can handle is mp3s. I'm not sure how easy it will be to convert it without losses or find some player that will work on the phone. I forgot to mention that on Thursday of last week (if you consider Sunday at the end of the week and many people don't) I went to the annual Duke basketball banquet. It consists of a meal, which our tickets didn't include, and an awards ceremony. The ceremony consists of lots of long speaches given by the coaches and graduating seniors. The seniors tend to get overly emotional. There are also filn clips set to music chosen by either Mrs. Krzyzewski (past years) or one of the Krzyzewski daughters. When I first started going to these, back in1986, all the players hung around for autographs afterwards, which was loads of fun. Most of them made a quick escape this year. I did manager to accost Shavlik Randolph and David McClure. As the success of the team has grown over the years, it's been harder and harder to get tickets to the banquet, so I hadn't been in a long time. I was able to get another autograph from Coach K and was able to tell him that I first got his autograph 19 years ago. Somewhere we have a badly detiorated VHS tape of my getting that autograph, because the local ABC affiliate, WTVD, put it on the news. I didn't see any television cameras this year, because I guess the novelty of a successful season in Duke basketball as worn off a bit since then. I was going to mention something else from that week that I'd forgotten. I need to start jotting down what I want to mention in my Treo 650. I can't believe that I haven't thought of that before. Did I do anything this week? I went to Eastern Lights for dinner on Wednesday and afterwards worked on my mom's birthday present. I made an ornament type thing to hang in the window using beads and gold-filled wire. I thought it turned out pretty well. Hopefully it will look nice hanging up. Thursday was her birthday, so we went to Kemp's for dinner. I was able to eat oysters. I'd gone to Rudino's for lunch that day and eaten another entire Spinach Sophia grinder. Those things are just fantastic. In any case, I wasn't overly hungry at dinner time. After that, my dad suggested that we pick up some pastries at the Coffee Cafe around the corner from my house and continue to celebrate at my house. I was really stuffed after that. They had a chocolate "croissant", which was wonderful. It's not like any croissant that I've ever had, but it's very good. I think the dough is more like you'd expect with a danish or something. On Friday evening, I met my parents at the Duke Pre-Majors Advising annual picnic. The weather was very pleasant and they had good fried chicken. Again, I'd had a big lunch of Shrimp Pad Thai at Champa, so I wasn't terribly hungry. A meal consisting of chicken wings and brownies was pretty nice, though. We went to Nantucket Cafe & Grill last night and I tried their pork ribs. They are very good. The meat comes off the bone very easily and they are generous with their sauce. Not bad. I have leftovers in the fridge, which I'm looking forward to having for lunch this week. Yesterday, after going to the OCRA Ham Radio breakfast, I spent almost the entire day making jewelry. I made myself three bracelets and five pairs of earrings. The earrings were mostly very small, so they were quick and easy. It was fun and it will be nice to have more jewelry, since I so desperately need it. Right. 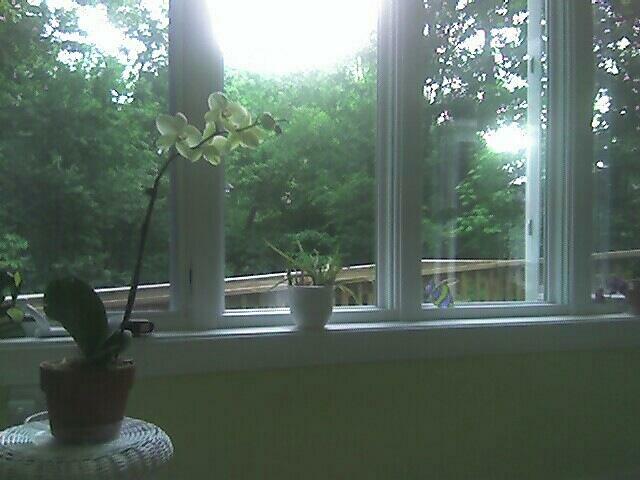 It is so very nice and green around here again. I really love spring. Lots of things are blooming in my yard now. The "stratosphere" daffofils are still blooming along my walk. The dianthus is blooming along the concrete pad in front of my house. The bright green oak leaves are just fantastic, though. You can just barely see the neighboring houses now. The good thing is that I was pleasantly surprised at how it looked without leaves. Several people have said that it almost looks as if I live in the mountains, because this is a fairly high spot compared to the rest of the area. It's definitely nice to be able to appreciate all of the seasons.